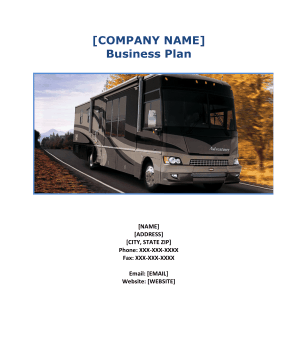 This free, printable business plan can help RV repair and maintenance companies identify weaknesses and strengths within their corporations and create projected profit and loss charts. [COMPANY NAME] is a sole Proprietorship formed October 2003 in the State of [STATE]. The owner is [NAME]. [NAME] has over 15 years experience in the industry and is a Master Certified Technician and continues to keep his certifications current. [COMPANY NAME] is an authorized repair shop for most RV manufacturers and parts suppliers. The Company will repair any part of an RV, from roof to floor, from inside and out with all work guaranteed. Additionally, [COMPANY NAME] carries a full line of camping supplies and RV parts such as: House wares & Camping Gear, Hardware, Phone Accessories, Electrical Supplies, LP Gas & Accessories, Fresh Water Supplies, Toilets & Replacement Parts, Sanitation Supplies, Chemicals, Roof Vents, Roof Lids, Vent Covers, Plumbing Vents, Towing Supplies, Covers & Awning Accessories and more. The focus of this business plan is to put forth objectives to work efficiently and effectively, expand internal operations giving the Company the opportunity to grow. [COMPANY NAME] is ready to elevate to the next step. The Company is seeking grant funding in the amount of $351,000. The grant funding will be used to add two new bays, a lift for one of the bays, upgrade building improvements, purchase production equipment, purchase office equipment and hire two services technicians. 1. Work efficiently and effectively - We pride ourselves in doing the job right the first time. [COMPANY NAME] has been in business since 2003 and we guarantee our work. 2. Work on a Timely Basis - As many of [COMPANY NAME]'S customers are on vacation, completing our work on a timely basis is one of the most important factors for customer loyalty and word of mouth advertising. 3. Expand Territory - [COMPANY NAME] currently works in the [COUNTY] area. The Company wants to expand its customer base to the RV owners in the surrounding Counties and in the RV parks. 4. Expand Customer Base in our Territory - Through an aggressive advertising campaign, [COMPANY NAME] wants to expand the customer base in our Territory, with an emphasis on the surrounding Counties. 5. Expand Internal Operations and efficiency - The Company wants to expand current bay area to add two new service bays, a lift for one bay, building improvements, purchase production equipment, purchase office equipment and hire two service technicians. [COMPANY NAME] strives to be the premier source for RV repair and parts in the [COUNTY] area. The Companies owner has over 15 years experience in the industry. The Company will repair any part of an RV, from roof to floor, from inside and out. We guarantee all of our work and strive to build customer loyalty and lasting relationships. 1. Experience - We are in business over 6+ years with a reputation of quality on-time service. The Owner has over 15 years experience and is a Master Certified Technician. 2. Family Business - Over the last 6+ years we have built customer loyalty and lasting relationships. 3. On-Time Service Repair - Many of our customers are on vacation and we want to get them back to their vacation as quickly as possible. 4. Quality Product & Service at a Fair Price - Due to the Companies long history with suppliers and low overhead, we can give the highest quality product/service and be price competitive in the [COUNTY] area. 5. Parts and Supply availability - Large inventory of RV parts and supplies in our retail store. [COMPANY NAME] has been here in [CITY], [STATE] for 7 years combined with 27 years of experience working on RV's. We have certified technicians here waiting to assist your needs. We specialize in working on Air Conditioners, Heaters, Furnaces, Refrigerators, Water Heaters, Toilets, and many more. We also have a parts store with a variety of parts that you may need. We look forward to seeing all you snow birds and locals. [COMPANY NAME] has a large service area and retail store for all of your RV supplies. Additionally, the Company has a mobile repair unit; we will travel within 60 miles of our location for on the road repairs.